Gaia goes to L2 – what’s an “ell-two”? Just like observatories on Earth, space observatories like Gaia like it quiet and dark. In space “quiet and dark” means far away from Earth. At large distances from Earth, the motion of spacecraft are no longer controlled only by the gravity of Earth, but also by other gravitational sources – most prominently by the Sun. The orbital motion of Earth around the Sun also influences the motion of spacecraft. The good thing about these forces – if you are a spacecraft – is that in five locations, all these forces balance out to create a stable location from which to study the wider Universe. These points are called the “Lagrange points”, or L-points. L1 is located between the Sun and Earth, 1.5 million kilometres from Earth, and L2 is on the opposite side of Earth at the same distance. L3 is behind the Sun 300 million kilometres away. L4 and L5 are leading and trailing the Earth respectively. If you imagine two equilateral triangles with the baseline joining up the Sun and Earth, then L4 and L5 make up the third point of each triangle either ‘ahead’ or ‘behind’ Earth along its orbit around the Sun. 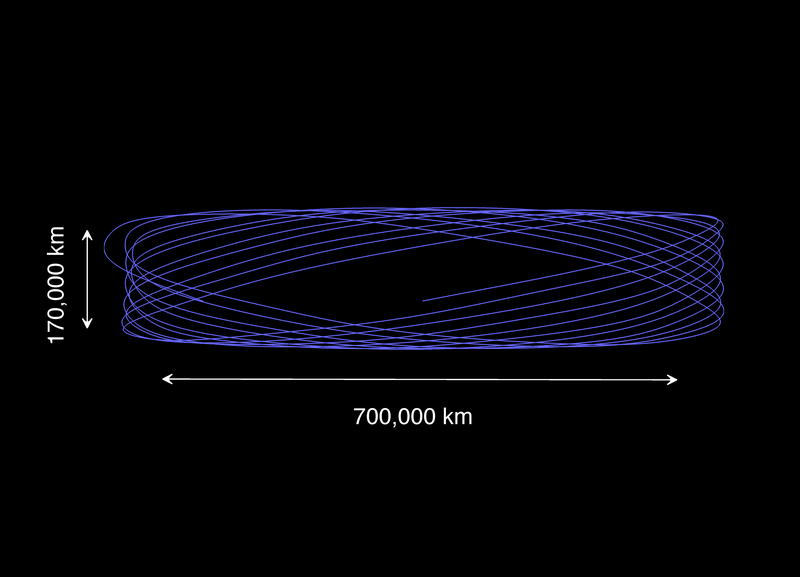 Gaia, like many other spacecraft that have gone there before, will orbit around the L2 point. It is not stationary here, or else Earth would always be in front of the Sun as seen from the spacecraft – then Gaia would be in eclipse and there would be no power from the solar arrays. Instead we will make Gaia oscillate around the Lagrange point, moving just like the tip of a pendulum. But in space we are not restricted to oscillate up and down and to and from, but also left and right. The path of this thee-dimensional pendulum motion traces out a pattern that we call a Lissajous orbit (see figure on the right). 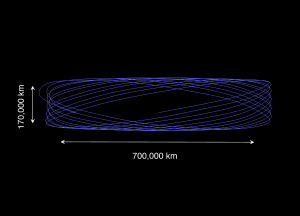 One period of Gaia’s pendulum motion takes half a year, and it is one job of the mission analyst to ensure that Gaia is positioned correctly with respect to the Earth and Sun when it first arrives at L2 to make sure that its orbit does not take it into an eclipse. More about the life of a mission analyst in a future blog post! This article was submitted by Markus Landgraf, Mission Analyst at ESA’s Operations Centre ESOC in Darmstadt. Thank you for sharing, Markus! And if Gaia is only partially eclipsed, that could be tolerable in terms of power supply, but thermal fluctuations would probably be extremely problematic, isn’t it ? Anyway, all my best wishes for this phenomenal mission. Thanks for all, and once again, best wishes for the spacecraft and for the team ! @KD: there’s been a slight glitch in your calculation. The angular size of the Earth as well as the Sun as seen from L2 is about half a degree – the Sun would shine as a very narrow ring when located right at L2. As a consequence Gaia would receive only 14% or so of the full solar power, which would not be sufficient. You are correct on your other point – thermal stability is an absolute must for Gaia, so even a small variation of heat influx compromises the mission. One way or the other – we cannot go into eclipse. It’s a different story for eclipses of the Sun by the Moon. We can accept those for a couple of hours. Thank you very much for your wishes and stay tuned for more on Gaia in the coming weeks! Thanks a lot for your answer ! I just made a (bit) more precise calculation and find now around 16% : for sure, taking more precise values, I should converge to your 14% ;-). So it’s clear it’s not enough for electric power ! And for the thermal stability, thanks for the confirmation and also for the impact of Moon’s shadow : I didn’t thought about that ! I I’m not wrong that time, it’s an impact of up to 6% less light, which is surely ok for electric power (as you took it into account) and in terms of thermal impact, that should be around 8K difference for the shield, isn’t it ? Once again, all my best wishes (especially with change to VS-06 which must be stressful). Too lazy to read on GAIA probe. Solar panels are the only power option for GAIA why not nuclear power?? @ nithin, I’m not part of the design team, just an “informed amateur”. But I think there are several reasons affecting the decision not to use nuclear power (by which I assume you mean thermo-electric generators, or Radioisotope Thermoelectric Generators (RTGs)). RTGsare most often used for missions far from the sun, where solar power decreases as the square of distance from the sun (e.g., Jupiter, Saturn, farther out). The Mars rover, Curiosity, would seem like an inner-solar-system exception; I presume it uses a RTG to support its larger “electrical metabolism” compared to the solar-powered rovers Spirit (may it rest in peace) and Opportunity. At L2, there is relatively plentiful sunlight. Second, an RTG , even “held at arm’s length” on a structural boom, such as those used in the Voyager and other missions, would be a huge source of heat near GAIA, complicating thermal control. Orientation and spin control would also be more complicated with a significant mass (RTGs generally use dense elements such as Plutonium as their heat source) off-axis from the rest of the spacecraft. Third -and at this point I’m speculating- while the above reasons probably had a much larger role in the decision processes, some of the general public are squeamish about possible safety problems of launching radioactive material at the top of a huge fiery rocket. Another reason not to use a RTG could be radiation exposure to the billion-pixel sensor array. There is already quite a bit of ambient solar and cosmic radiation and I’m not sure whether the added amount from a RTG would be significant, but it could be (especially if you aren’t allowed much mass for shielding). Thank you Ian! You can find more information about the mission and latest images and animations on our Gaia ministe at http://www.esa.int/gaia. Will Gaia be able to spot the ATENs and what technology does it use to spot these.